One of the staples in San Antonio is the taco. We eat them for breakfast, lunch and dinner. Tacos can be found in mobile food trucks, hole-in-the-walls, lobbies of where we work and high class restaurants. But to paraphrase the Bard, would a taco by any other name taste as sweet? Recently there was a discussion at my workplace about the difference between a taco and a burrito. This launched a huge discussion between the nuances of each item. Want info about SA without the spam? Subscribe to the SA Flavor newsletter. I have experienced this conundrum firsthand. 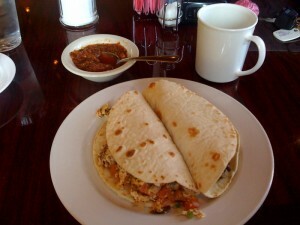 Growing up on the South Plains, I always referred to the breakfast meal of eggs, bacon and cheese in a tortilla as a “breakfast burrito.” Coming to San Antonio, many of my coworkers kept asking me if I would like a bean and egg “breakfast taco.” I kept declining because I could not understand why anyone would want a crispy taco shell with beans and eggs first thing in the morning. It was several months before I realized that breakfast tacos in San Antonio did not come in a crispy shell but rather a soft tortilla. Once I became enlightened to this fact, I have happily ordered breakfast tacos ever since. Be sure to read The Great Taco Debate on SA Flavor for my own breakfast taco story. 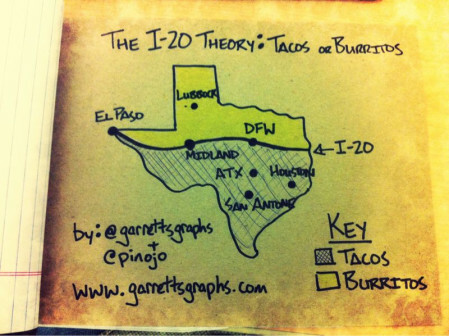 This led me to develop what I refer to as the I-20 Taco Theory. Interstate 20 more or less cuts Texas right in the middle as the road travels East to West passing through DFW and Midland before swooping down South to El Paso. People who live either side of this line have drastically different views on tacos. The contingent who lives North of I-20 referred to the morning item as a breakfast burrito. This group feels that by default the word taco implies a crispy shell. Folks North of the line refer to anything in a tortilla as a burrito although there are some factions who deviate and call the smaller tortilla item a soft taco. Tacos or Burritos? Weigh in with you thoughts on the comments below! You then have the people who live right on the line who are confused on whether to call an item a burrito or taco. There are tons of places in the DFW Metroplex that serve tacos and an equal amount that serve burritos. These Texans have adapted and just call it by the name that is at the restaurant. The only exception might be in El Paso where it seems that it more often than not referred to as a taco. While I am not advocating for either the use of the word “taco” or “burrito,” it is my hope that this article can at least provide some insight to those traveling to Texas or within Texas to understand what the heck they should ask for depending on what city they are visiting. UPDATE: I was actually interviewed by my friend over at Hilah Cooking for her newest edition of the Breakfast Taco Book (the I-20 Theory even made it into her book)! If you like cooking—or are interested in learning—be sure to check her website and videos out!